This week was both a hit and miss with new recipes. My family absolutely loved theFrench's Crunchy Onion Chicken, but the Honey Sesame Chicken from Six Sisters' Stuff did not get as warm of a reception. However I can not say it was a total bust because while I was on the Six Sisters' Stuff blog getting the recipe for the Honey Sesame Chicken I ran across their Banana Bread Pancakes with Vanilla Maple Glaze recipe. Which I made yesterday and it was absoultely AMAZING! So while we had one bomb this week with new recipes we gained two new recipes to add to our regular menus. We have several new recipes planned for this week, so hopefully we will do as good this week as we did last week or perhaps even better! 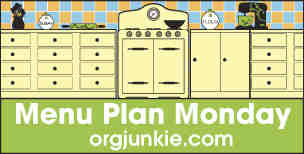 Join us for Menu Plan Monday at I'm An Organizing Junkie! The past few weeks have been crazy, so this week I really need to stay at home and catch up on some work. Plus we have been eating out a lot lately so it's time for some good, home cooked suppers this week.